Getting into Clock Repair?. Cleaning, Bushing and Lubrication are the top jobs to do a good job. Thinking of buying a Expensive Bushing Machine?. Instead Learn Bushing Clock Plates by Hand. So I focus on the type you'll probably buy. At last, the complete story of the Culver brothers and their celebrated calendar clock "FASHION". This book finally puts to rest all of the misinformation and untruths about the calendar clocks, where they were manufactured and how they were sold. In Quest of Clocks by Kenneth Ullyett. Hardcover Book, 270 pages. 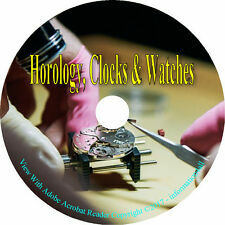 This DVD contains 67 interesting books relating to making and repairing clocks and watches. 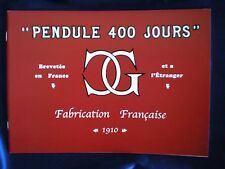 Various interesting books about the history of horology, about making and repairing watches and much more can be found and explored. Horology, Clocks & Watches. A Practical Course in Horology – By: Harold C. Kelly – 200 pages. Chats on Old Clocks (1917) – By: Arthur Haven – 312 pages. Rules and Practice for Adjusting Watches (1920) – By: Walter J. Kleinlein – 128 pages. My video will show you the Overhaul/Repair process from Start to Finish. Many teeth needed to be replaced and pinions were worn and broken, pivots and bushings were replaced, 200 years of old repairs needed to be removed and re-done. The Clock & Watch Makers Guide to Gear Making, New! This guide does not pretend to be a complete treatise on horological gearing, but does focus on several useful gear types to provide the ambitious watch and clock maker,inventor, or model maker with enough basic information that he will be able to design gears and the cutters to make them. 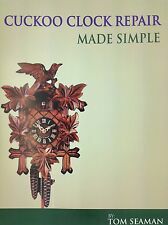 Jaeger LeCoultre Atmos Perpetual Clock Repair Manual-Hard to Find! This book was written by the person responsible for the recovery of the Swiss industry and its reorganization around machine mass production. The reports he wrote were so sensitive publication was suppressed and they were not printed until 115 years later. Also included with the 1959 catalog is the Mariner and The Pilot Clock Brochure. One for Junghans, one for New Haven and one for installing bushings. At less than half the cost of other Training Video's you can experience it for yourself. The video puts you closeup at the workbench instructed every step of the way. Price Guide None. Publisher Clocksworks Press, 1999. I hope to hear from you soon. Others may be hard to find. This book is a 2002 reprint of work originally published in The Jewelers’ Circular and Horological Review in 1886, 87, 88, 89, 90, and 1891. Excellent condition. – Book 721. Over 7 hours long. 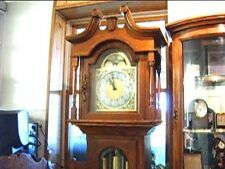 Tall Case Grandfather Clocks are the Proud Center Piece in every room. Its History makes Owners very proud of their Clock and the way it announces itself every hour. I explain the repair process by putting myself in your position. 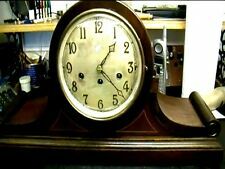 Up for sale it the bookClockmakers and Watchmakers of Lancaster County, Pennsylvania by Stacy B.C. Wood, Jr. Subsequent to its publication, Wood continued to collect information about Lancaster County makers and their clocks. Young Father Time by Mussey 1950 Book about famed Clockmaker Eli Terry Illust. By Barrows Mussey. Condition: Very good condition inside. Dust jacket has wear and tear but did its job protecting the book. No tears, stains or markings. Let's face it, buying tools can be expensive, very expensive. But in needn't be that way. This book describes how to build an entry level lathe using an electric drill. Although not as precise and perfect as a professional made watchmaker's lathe this little lathe will get the beginner started on his lathe work. It is a for the beginner to advanced clock repairman. Many detailed drawings, black & white photos & step-by-step instructions. #113, Sonora; New Haven, Sessions 2-train, Waterbury double deck, Ansonia, Globe, Winterhalder, Jacques, Junhans, Hermle, Urgos 06 Series, 9 tubular bell; Kieninger - KSU/RSU; Jauch, Mauthe-W500 & Smith's. 230 pages. Hard cover. The spine is coming apart. Fair condition. Burn’s tables I-III are included in this book. To a considerable extent, it is now possible to do so. Soft cover. Excellent condition. New ListingJaeger LeCoultre Atmos Perpetual Clock Repair Manual-Out of Print-Hard to Find! Here is a Jaeger LeCoultre Atmos Clock Repair Manual. This is a general manual for most of the Atmos clocks made. This is 14 Pages. I understand that both manuals are out of print and hard to find. COVER HAS LIGHT SHELF WEAR AND MINOR BUMPING, SCRATCHING AND CREASING. PAGES ARE CLEAN AND TIGHT. SPINE IS UNBROKEN. 1987, NAWCC, 120 PAGES, BLACK AND WHITE PHOTOGRAPHS. The narrative in this book is rich; the illustrations are superb. This in-depth text is a must-buy book for the collector, dealer, or historian of antique clocks and watches. THE HISTORY OF CLOCKS AND WATCHES by Eric Brut, Little, Chartwell Books, NJ, 1979. This soft cover, 64-page book isHamilton Watch Identification and Price Guide by Roy Ehrhardt. It covers Hamilton wrist and pocket watches from 1893 to 1936. The original antique and historic material has not been changed. In addition they provide a valuable source for reference. Hard cover with jacket. The jacket is in fair condition. The rest of the book is in excellent condition. – Book 759. 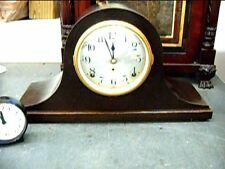 Up for sale are 2 clock books:Clocks andThe Beauty of Clocks. Taking it a step further, how could these wheels be made to run so precisely and why do they stop after so many years of running. You'll begin to recognize the worn area's and know how to repair it back to original health. There are black and white illustrations showing different styles of clocks, diagrams of how clocks work, etc. This is 312 pages of good reading. Hard cover. Good condition. – Book 202. 318 pages. A level, a couple of pliers and screwdrivers are what's needed to do the job. Doing it yourself can save a lot of money with this quick and easy guide. Over 1 hour long. So far everything is going great and as you can see by the pic. This is the book we have near our computer as a quick and accurate reference. Written by G.H. Baillie. 388 pages. Hard cover with jacket. Fair condition. – Book 330. 212 pages. Hard cover with jacket. Fair condition. This book is number 28 of 1,000 signed copies! – Book 188. 1720 PORTABLE BRASS SUNDIAL AND COMPASS. It was made by Butterfield, an Englishman, who settled in Paris in 'the year 1720. ORIGINAL 1920s TRADE - ADVERTISING CARD. IT WAS PRINTED IN THE 1920s. SLIGHT PAPER LOSS - SMUDGING - ROUNDED CORNERS - WEAK CORNERS - SURFACE CREASES. This is a German book translated into English. There is a lot of info in this book. 522 pages. Hard cover. The first few pages are stuck together near the binding. Fair condition. – Book 523. Marvin Schwartz is a well-respected collector of antiques in several areas. This book represents a choice of information and pictures not available to the public. We see examples by Tabor and Willard of Massachusetts, by Burnap of Connecticut and Hill and Dominy of New York, by Wood of Philadelphia and Pearson of New Jersey and others. THE POCKET SUNDIAL. ORIGINAL 1920s TRADE - ADVERTISING CARD. IT WAS PRINTED IN THE 1920s. THERE IS ADVERTISING TEXT ON THE BACK! hole and impinged on the inner surface of the opposite side of the rim which was engraved. 256 pages. Hard cover with jacket. Good condition. – Book 629. There are black and white illustrations showing different styles of clocks, diagrams of how clocks work, etc. This is 312 pages of good reading. The Clock Book by Wallace Nutting. 312 pages. Hard cover. Fair condition. – Book 186. This is the book we have near our computer as a quick and accurate reference. Written by G.H. Baillie. 388 pages. Hard cover with jacket. The jacket is fair condition. The rest of the book is in excellent condition. This exploration of the evolution of the pendant/pocket watch is divided into centuries. Each century explores what was happening in the world and how these events and fashions influenced watch making. 216 pages. Excellent condition. – Book 736. Number 14, Spring 1984. The book is a wealth of text and pictures and is in excellent condition. – Book 761. 144 pages. Soft cover. Good condition. – Book 425.